The Democratic People’s Republic of North Korea is not known for embracing outside influences. But the country’s ruling elite are such big fans of Apple that North Korean technology has been designed to mimic hardware and software developed by the company. And Pyongyang’s admiration for Cupertino apparently goes much deeper—and darker. Outside experts believe a program similar to what Apple uses in its OS X and iOS is believed to be the basis of the booby-trap that thwarts attempts to disable security functions in Red Star. It’s now a staple on North Korean phones. And by 2014, all mobile phone operating systems had been updated to include the watermarking system to reject apps or media that don’t carry a government signature of approval. It’s the same mechanism used by Apple to block unauthorized applications from the App Store, but in North Korea’s case serves instead to control access to information. With Steve Jobs’s reputation as an authoritarian in mind, the idea that a dictator would use strategies similar to Apple’s “walled garden” in order to censor information seems oddly appropriate. Of course, one could argue that Apple uses this type of blocking software to keep malware and broken apps off of people’s phones, and that’s a good thing. The North Korean regime uses the technology as a form of thought control, and that’s a bad thing. 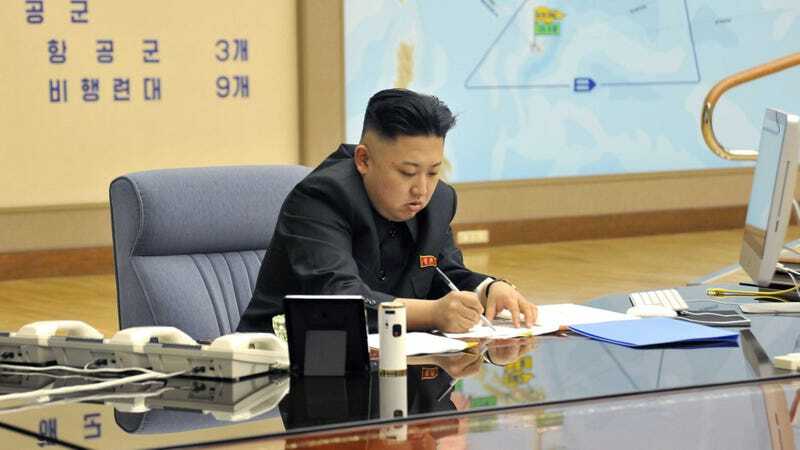 We’ve known for a long time that Kim Jong Un is an Apple fan thanks to photos showing him using devices like the iMac and the MacBook Pro. The extent to which Kim Jong Un and his henchmen are applying Apple’s ideas to North Korean technology remains vague, however. We do know that North Korean companies are eager to incorporate Apple’s hardware and software designs into their own products. Earlier this year, one such company released a tablet called “iPad,” and images of North Korean-made iMac clones have been floating around since 2015. The government-built operating system mentioned above also looks almost identical to iOS and OS X, from the app design to the “spinning beach ball” wait icon. Any attempt to change its core functions or disable virus checkers results in an automatic reboot cycle. Files downloaded from USBs are watermarked so that authorities can identify and trace criminal or subversive activity, a security measure that takes aim at the spread of unauthorized content from South Korea, China and elsewhere. Red Star also uses a trace viewer that takes regular screenshots of what is being displayed. The screenshots can’t be deleted or accessed by the typical user but are available for checking if a trained government official decides to take a look. This all sounds like some dystopian sci-fi novel, where everyone stares at the same gadgets not realizing that the thought police are on the other end staring right back. It’s also one of any red-blooded Americans’ worst fears when it comes to Silicon Valley’s relationship with privacy. Companies like Apple and Google know where we are and, roughly, what we’re doing at all times. Facebook apparently knows what we’re going to do next. But we let it happen, because we trust these companies not to behave like authoritarian regimes hellbent on staying in power. Maybe it’s not all that different, though. Maybe Kim Jong Un and his small army of obedient developers were able to build all of their scary surveillance devices because companies like Apple showed them how. It’s hard to know exactly how much inspiration the supreme leader took from guys like Steve Jobs and Tim Cook. But one thing’s more glaringly true than ever: Apple knows how to build walled gardens—and it’s so damn good at it that actual dictators are borrowing ideas from iOS and OS X. That’s a frightening reality in and of itself.